Hello again! It’s hard to believe the semester is already over halfway over! Over the past few weeks, I have had opportunities to explore Chicago and better understand the city my students call their home. We have had several non-routine days at Walsh recently, including festivities for Halloween and Día de los muertos, or Day of the Dead. 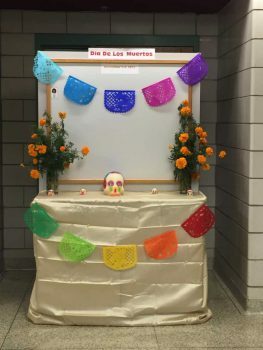 The teachers decided to set up an altar in the school hallway to which students and teachers could contribute photographs and artifacts to commemorate loved ones who have passed away. Although the initial intent was to leave the altar up only during the actual days of Día de los muertos, the students requested that we leave the altar up for a few weeks instead. Students have continued to bring in photographs to add to the altar, and my cooperating teacher ended up making paper flowers for the altar instead of continuing to have to replace the real ones a teacher initially brought in from his mother’s garden. In addition to participating in in-school events, I have been able to attend volleyball games in which several of my students from each of my classes participate. The games were a great opportunity to continue to build relationships with the students and to get to meet and talk with some of the parents. I was impressed with the communication and support I saw between the girls on the court, and it was great to see students from different classes and social groups interacting and working together. In my algebra classes, we have spent the past several lessons working on word problems from which students have to build and solve equations. Students have mastered the process of solving equations – although they still occasionally have issues with the distributive property – but it is taking longer to build their confidence in their ability to create the equations they need to solve. At the request of students in my homeroom class, I have been creating word problems that use the students’ names, and I have rewritten most of the problems the students do in class and for homework so that they are based on situations to which the students can more easily relate. Having these connections to the problems have made it easier for the students to build their conceptual understanding of the material. During my time outside of school, I have been trying to explore Pilsen and other parts of Chicago. Pilsen recently held an event called “Open Studios,” during which artists in the area displayed and sold their work out on the streets and in many of the local businesses. One of the artists was selling sugar skulls for people to use to decorate altars for Day of the Dead. Even for those who weren’t interested in purchasing any of the artwork, the Open Studios were still a great way to gain knowledge of and appreciation for the art and culture in the community. In addition to exploring Pilsen and learning about their ways of celebrating Day of the Dead, I also had the opportunity to go on Chicago’s Original Architecture Tour. 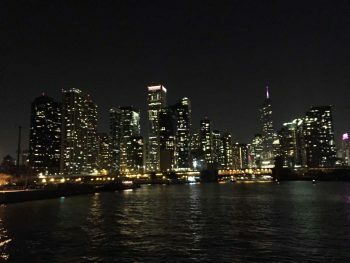 Since I moved to Chicago, many people had mentioned that I needed to make time to take the tour, and I ended up doing so on a Saturday evening when there were only 70 people on a boat that could hold close to 300. The smaller group meant that guests on the tour could more easily move around the boat to see sights in all directions, and we had an extremely clear night, which made it easier to see the lights of the city as we traveled along the river. Since I spend most of my time in Pilsen, it was interesting to learn more about the downtown area and the history of the city as marked by its architecture. The tour guide recommended The Devil in the White City to those who were interested in learning more about Chicago’s history, so I will have to add the book to my reading list! The number of weeks left is dwindling, so I’ll have to make sure to take advantage of each moment I have to continue exploring the different communities throughout Chicago!